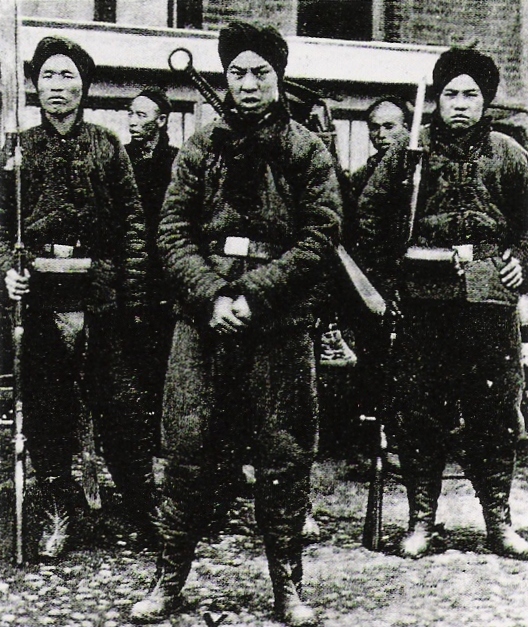 I can make out the dao, the guan dao, the quiang, and the trident (name escapes me atm), but I'm unsure as to what kind of firearms they were carrying at the time. I'm also not sure as to what kind of blade the man in the black and white photograph is wielding on his back. Would anyone happen to know what other kinds of weapons would've been used by the Boxers at this time period? The man in the middle of that photo looks like he has one of the southern style broadswords (nandao). i`ve never seen such a sword with a circular pommel. as for the firearms, i read in wikipedia "Qing armies...... trained and equipped according to western standards.....The first of the new armies was founded in 1895 with German arms...."
I was wondering if they could be Japaneses Arisaka rifle. The rifle in the painting looks a bit more like an Arisaka than a Mauser. I think it could be a Mosin Nagant rifle model 1891 as well but I am leaning a little more towards the Arisaka. Looks like it has a bit of a grip which the Nagant didn't have. Than again the rifle in the painting could be a needle rifle, but that would be unlikely. Its also not like to be a Krag-Jørgensen Rifle. from the looks it (the right one) could be a arisaka. but the first arisaka (type 30) was introduced to the japanese army from 1897 onwards, and the boxer rebellions startet just two years later. so i think, if it is an arisaka, it must have been captured or something, it probably wasn`t sold by the japanese in big numbers (and the mauser 1871 was officially purchased by the qing dynasty). difficult to tell, i even don`t dare to say, both rifles are of the same type. the hanwei dadao however is pretty cool.